Not too many years ago, before the USB stick came along, if you wanted to clean install Windows, it had to be done using the CD or DVD and an optical drive. Thankfully, things have moved on and users with a sufficient amount of knowhow have been able to get their copy of Windows onto a USB flash drive and install from it for a little while now. With the introduction of Windows 8 you can now even choose to install it using a USB flash drive from within the Microsoft Upgrade Assistant. Installing Windows from USB has some advantages such as not having to worry about scratching or damaging the Windows installation disc, and it’s more convenient to carry around a tiny USB flash drive than optical media. They are also a necessity for netbooks, small laptops and the increasing amount smaller form factor PC’s that no longer use ROM drives. And to add to that, a reasonable speed USB stick can complete a Windows install a good bit quicker than an optical drive thanks to the much faster access times. Here we list 10 ways to enable you to get your Windows install files onto USB flash drive taking advantage of the benefits it has to offer. For ease of use, we have listed which versions of Windows are supported for putting onto USB according to each tool’s author. The tools themselves should run on Windows XP to Windows 8. Make sure you have at least a 4GB USB flash drive to hand before trying to perform a Windows to USB, portable versions of the software were used where possible. If you don’t have one, you can directly download a Windows 7 ISO from Microsoft’s Official Distributer. USB install support for: Windows XP, 2003, Vista, 2008, 7 and 8. The WinToFlash utility has quite a lot of options and support for installing from XP right up to windows 8 using a USB flash drive. In addition to Windows, there are also some other related functions such as creating an XP/2003 recovery console and error checking. The program has 2 different modes which can be used depending on your experience level, a Wizard mode which offers to get you going in a few easy steps, or an Advanced mode which gives a wealth of options and more control over the whole process. The program requires you select a drive or folder as the source, not an ISO image. Sadly the setup installer includes the BetterInstaller adware and even the portable version contains adware on 1st run and also uses inline ads. 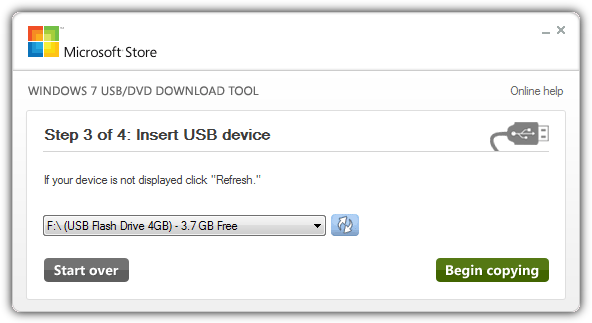 USB install support for: Windows Vista, 2008, 7 and 8. 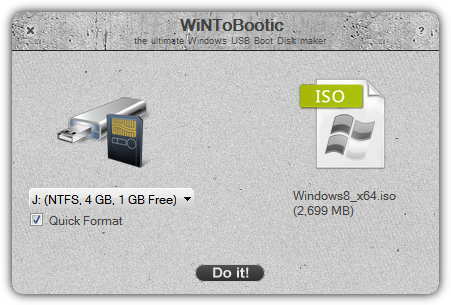 WiNToBootic is designed solely to be a small and completely portable standalone executable that can get the Windows Vista, 7 and 8 install files onto USB flash drive with the minimum of fuss. A useful feature not immediately apparent is you can click on the source arrow to locate an ISO file to be converted, or you can alternatively drag and drop an ISO, a folder containing the Windows files or even an install CD/DVD from My Computer. Simply make sure your USB drive is selected if not already, choose whether to format or not and press the Do it! button. WiNToBootic is one of the quicker programs at completing the process and also one of the easiest to use. The .NET Framework v2.0 is required. USB install support for: Windows XP SP2+, 2003, Vista, 7 and 8. We’re quite big fans of Rufus because apart from being a great little tool to format USB drives and also check them for errors and bad blocks, there is also direct USB support to install MS-DOS and FreeDOS which is good for BIOS flashing, various Linux images and you can install Windows from XP SP2 up to 8. Rufus is also very reliable and one of the fastest tools around at getting the Windows install files onto the USB drive while still being easy to use. Simply click on the select ISO icon and find your Windows ISO image, then click Start and wait for the process to complete. Nothing else needs to be touched as the program will select the best file system and name for you. Rufus is a completely portable executable and is less than 500KB. USB install support for: Windows XP, Vista, Server 2003/2008, 7 and 8. Josh Cell Softwares make some other nice tools such as Advanced Tokens Manager and WinAIO Maker, while WinUSB Maker is a smart tool that can install just about any version of the Windows install CD/DVD from XP to 8 onto USB. It can also install a Linux Grub loader or MS-DOS if you wish, and includes a nice addition of a full USB backup and restore function to make a copy of the flash drive before putting Windows onto it. Another thing some users might find useful is the ability to work with and install using either an ISO image file or a directory with the extracted files if you have been slipstreaming or editing the Windows distro. 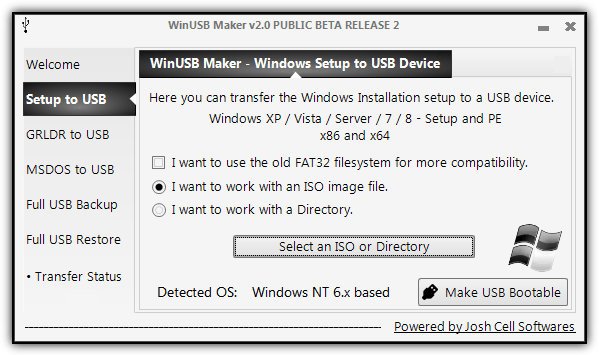 WinUSB Maker is a standalone executable and requires the .NET Framework v4.0 to run. USB install support for: Officially Windows 7, also worked for us with Vista / 8. This is Microsoft’s official tool for putting the Windows 7 setup onto a USB stick and has a disadvantage over most other tools of this type by requiring installation before creating an install USB drive. Microsoft says it only supports Windows 7 ISO images, but we also successfully booted and installed both Vista and Win 8 from USB using this tool. The program is a breeze to use and can easily put the image onto USB or burn it out to DVD if you want. Just follow the 4 easy steps and the Windows install USB will be created, although the speed at which the program creates the USB is known to be a bit slower than most other USB installer tools. Requires the .NET Framework v2.0 or higher. We have another 5 tools to put the Windows install files onto USB on page 2. Id like to use rufus. its easy use. Thank you so much for this post! I just used Rufus to install Win Xp from a flash drive, and it worked like a charm. It’s as fast and easy as stated, and it saved me a lot of time. It’s a great program indeed! I wasted some major time following the directions of some others; and it just didn’t work. Many thanks again!!! Hi, I used the YUMI to make my usb flash drive bootable and in him I have a linux SO, the Kaspersky Recover Disk, etc installed in the usb flash drive. 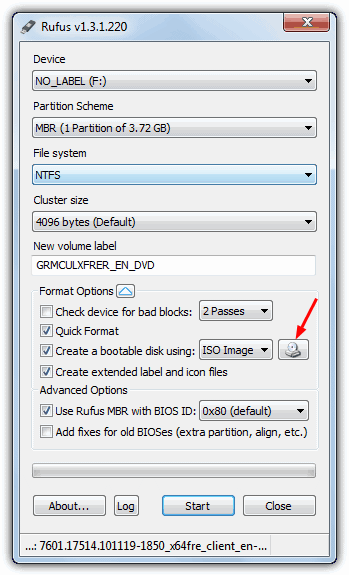 If I copy all files from Win7 DVD to root folder of flash drive, it will work? Having just the files in the flash drive won’t work because the Windows setup boot loader must be present in the flash drive’s MBR. Why? What wrong I’m do? You don’t need the Bootsect argument at all if you’re using Vista/7/8 to put Vista/7/8 install files onto USB, that’s why it’s noted in the article the listed method is for those operating systems only. In short, the “bootsect /nt60 [drive]” command is pointless when XP isn’t involved. Thanks Raymond..as always you are the best. Excellent info – saved me as most of my systems refuse to boot from the Win7 DVD though they can boot the Vista DVD. Need to boot from the installation DVD since I’d like to wipe the HDs (non-upgrade install) as part of the install. 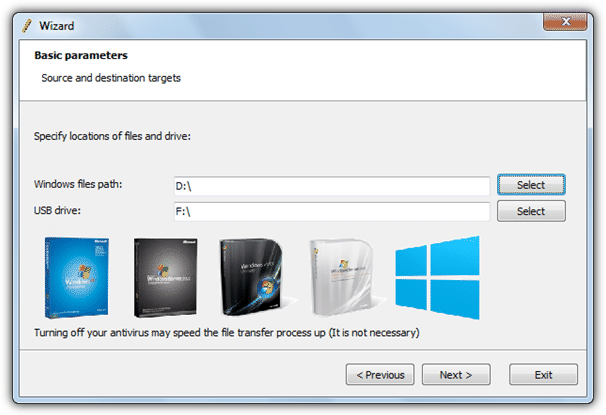 Your manual way with Win7’s DiskPart I’d not seen previously – nice and easily done (fast too). I was working with the older HP USB Formater utility – to make a boot USB but its formating was taking 2x as long. Found your post during its formating, started a second USB drive with your method – its done and the files are copied – HP Formater is still chugging along…… Thanks Again! I just tried this and it worked 100%. You are a life saver man, I had wasted a lot of DVDs trying to burn windows 7, and I could never get them to work properly. I give this post 5 stars. Good work!!! U THE MAN, works like a charm! a good tutorial ….. great share man!! thanks man , worked a treat! This is really good to those who have windows 7 copy, does this works also on all windows vista. This is a good article indeed. Indeed another spoiler right before Microsoft release this as their official move. A very good source from CNET once told that Microsoft is planning to sell Windows7 on USB for the benefit of NetBook users. thanks ray..it’s actually working for me,so thanks and keep up the good work.. Thanks Ray that is a good article.